Lenny Lamb is recalling about 900 Buckle Onbu infant carriers because some internal stitching is missing that could cause the infant to fall. The carrier is designed to strap the baby against the caregiver’s body at the hip. It is intended for children who can already sit unassisted. It is most commonly used for back carry. 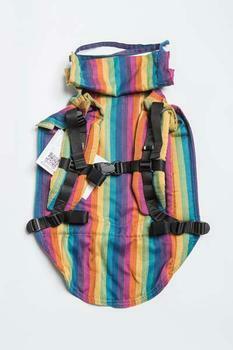 The woven, 100% cotton carrier was sold in 83 different styles and in one standard size. It has an interior panel to adjust the width, padded shoulder straps and an adjustable hood. A label with the manufacture date between 05.2016 and 06.2016 is located on the back side of the shoulder area of the carrier. The carriers were sold online at 5 Minute Recess, Ashley Hesch Bibetts, Lenny Lamb, Savanna Brown, and other online retailers from May 2016 through June 2016 for about $90. They were made in Poland. The recall was announced by the U.S. Consumer Product Safety Commission. A similar recall is being conducted in Canada. Consumers can contact Lenny Lamb toll-free at 877-487-1416 from 2 a.m. to 10 a.m. ET Monday through Friday; via email service@lennylamb.com, or online at https://us.lennylamb.com/ and click on Recalls for more information.